Just because my car died doesn't mean I never get around anywhere. In fact this week I've been on the road almost more than I was in the office! A group of us drove to a little village in the north of Moldova to discuss a new project proposal for that village with the church leaders. It was an interesting time together and always exciting to move ahead in the new things that God wants to do through us. We need lots of wisdom to hear His voice and follow His leading. These are some of the key leaders on our team, standing in front of our new vehicle. The pastor of Mateuti church is on the far left. Coming back into the city that evening, I suddenly realized that it was December. For the first time that I can remember, Moldova is starting to pretty up for Christmas long before the end of the month. 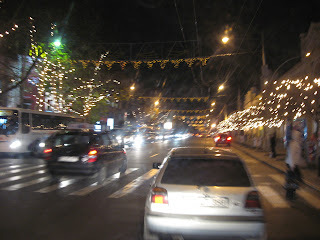 With "Old Christmas" (the Orthodox celebration) being on January 7, in the past little has happened early in December. But now that politics is moving Moldova westward, Christmas is starting earlier too. The Christmas tree is up downtown and the lights are shining over Stefan cel Mare and I need to spruce up my apartment for Christmas now, don't I? Just the next day, I was again travelling, this time with Matthew and Claudia and Tanea, to the village of Razeni. We had been invited to help the pastor celebrate his birthday by joining him for a 'shashlik' (barbecue). 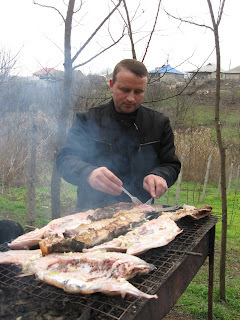 I was a bit surprised to discover that it was fish - great big ones!- that were being barbecued on the grill. We stood close to it to stay warm - it's not freezing cold yet but when you stand outside for a while you do get chilled. We also were able to visit with the Challenge into Missions student team who were working with the church that week, helping to build their new building. Matthew took lots of pictures of the walkway and park that his church group had worked on when they were here in the summer for a short term mission. He will be going to England on furlough soon and be able to show the church how great everything looks now. On Sunday I was on the road again, this time travelling with two of our team members who were going to their home church to give their tri-monthly report. 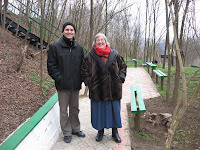 This is one of the fun things I get to do that gives me the opportunity to see different churches in Moldova, to meet the leaders and people in the church and to meet the families of the team members I am helping to care for. Visiting Vadul lui Isaac with Aurica and Slavic was a very pleasant time. They attend quite a large Baptist church and afterwards we had lunch at the home of Aurica's sister, whose husband is an elder in the church. I also discovered he is the Youth leader for the Baptist Convention and I had conversed with him on the phone before - nice to put a face to the name! One of the other things we do on these church visits is to sell books. 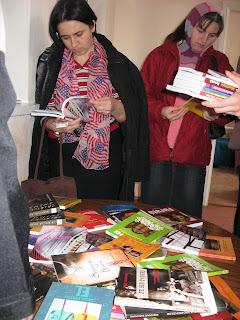 Recently we have re-vitalized our literature ministry and are getting more shipments of Romanian books to sell to Christians in the villages who rarely have access to Christian books that will help to build their faith and encourage them. We buy the books and distribute them at hugely discounted prices that make them affordable to the average Moldovan. This is a really significant ministry and it was very satisfying to see the excitement with which people swarmed around the booktable after the service. We went back with very few books left in the full box we had taken. On the way to Vadul lui Isaac on Sunday, Lilian was our driver. 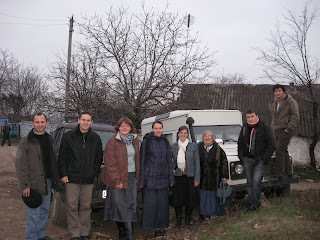 We travelled in the new vehicle that OM Moldova recently bought. It's quite the car...um..truck... um...vehicle! 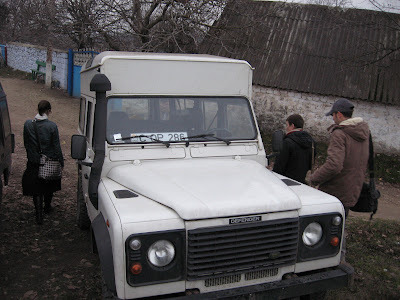 It is a Defender LandRover and the only one of its kind and size in Moldova. People stare as we go by - and that's quite something when you consider some of the other vehicles you see around here! On the way home, I had my first opportunity to drive "the tank" or "the monster" (we still need to find a good name for it!). So don't feel sorry for me that my car is no longer. 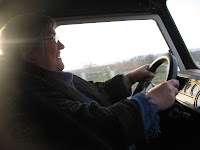 During the week I ride public transport and sometimes on weekends you will see me cruising in the Defender - missionary vehicle par excellence! Posted by Barb at 8:57 p.m.